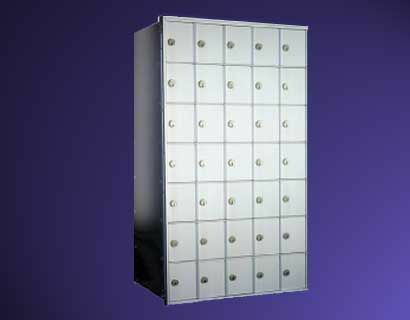 Constructed of aluminum, Horizontal Apartment Mailboxes are recess mounted and are highly customizable. The front door panel is mounted on a continuous hinge; front loading models require one compartment of each unit for a master postal or commercial lock, and rear loading models are equipped with a standard rear cover. The 1700/910 Series Rear/Front Loading Horizontal Mailboxes are constructed of all aluminum extrusions and materials. Standard 910 series mailboxes are the choice when space is a concern. Modules are manufactured without integral trim and the compartments are 5" high x 4" wide. Standard modules are 7, 8, 9 or 10 boxes high and 4 or 5 boxes wide. All doors operate on continous hinges and are 1/8" extruded aluminum with engraved door identification. Locks are 5 pin cylinder cam type with 3 keys (1500 changes). FRONT LOADING: Master door swings on a continous hinge. one compartment is required for access and cannot be used for mail delivery. The access door is equipped with a private lock. When multiple modules are used in one location all master doors can be keyed alike for convenience. REAR LOADING: All compartments are usable for incoming mail. Lift-off or hinged rear covers are available.